If you suffer from chronic joint pain, a method of treatment that you may not have considered is laser therapy. 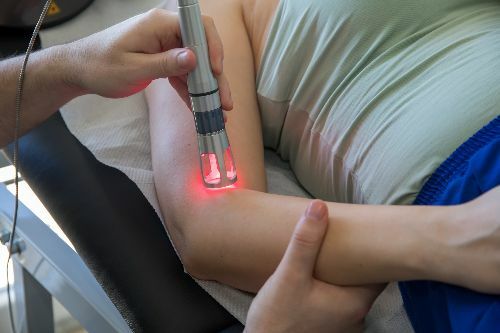 Though this is a newer form of treatment, cold laser therapy has shown very promising results in clinical trials, and is becoming commonplace in medical offices across the U.S. While there are a number of joint pain treatment options for those who experience consistent aches or debilitating arthritis, low-level laser therapy (LLLT) has emerged as one of the more effective treatment options available today. This post will briefly discuss some of the benefits of LLLT as an option for arthritis or joint pain treatment, and give readers a look into the process. Read on to learn more. Laser therapy is a safe, effective treatment for joint and arthritic pain, and has become a very common treatment option in chiropractic offices and pain management clinics. Low-level laser therapy (LLLT) has a potent anti-inflammatory effect, and by reducing local inflammation, natural healing is allowed to happen. LLLT also works by enhancing circulation, which encourages the affected areas to self-repair. For those who have dealt with chronic pain for years, cold laser therapy can often attack the underlying problem, restoring normal joint function and promoting longer-lasting pain relief. LLLT is clinically-proven, non-toxic, painless, improves and often restores function within the joints, and in many cases reduces the continual need for medications. If you are suffering from chronic pain in or around your joints, LLLT offers a promising solution to the problem. In short, LLLT can be very beneficial to a person who has suffered from arthritis or joint pain, and can be seen as an excellent option for joint or arthritis pain treatment. Low-level laser treatment is one of several treatment options available at Smith Chiropractic, which offers Class IV Laser Therapy as one of its treatment services. Other services include peripheral neuropathy treatment and spinal decompression, in addition to traditional chiropractic care. Smith Chiropractic is located at 1825 Main St, Unit C in Colorado Springs CO, 80911. Dr. Terry Smith has been practicing for over 28 years as a chiropractor, and is an expert in using techniques such as laser therapy as a form of joint and arthritis pain treatment. The office can be reached via telephone at (719) 390-5404, and you can also contact Smith Chiropractic online via the company website. Office hours are 9:30 AM – 6:00 PM Monday, Wednesday, and Thursday, and by appointment only on Tuesday, Friday, and Saturday. The office is closed on Sunday.